Raised garden bed kit dimensions: 6 feet wide x 6 feet long (6 inches deep) and 6 feet wide x 6 feet long (6 inches deep). Depth is 12 inches when stacked. 5/8" thick. Constructed of sustainably managed Western Red Cedar (Rough Sawn). 100% natural and chemical free. Mortise and Tenon joinery. Simple, no tool and splinter free assembly. Easy to transport. A beautiful, large double deep gardening bed. Use as two separate beds or stack them as one 12" double deep bed. Joining brackets included. Deep beds allow more planting in a smaller space, such as Square Foot Gardening. Made of highly revered and durable Western Red Cedar. The Hand Crafted Mortise & Tenon joints are the strongest available, while adding Old World style & charm. Extremely durable and easy to assemble, they will last for many years. Made in America with American materials. *Inner (planting) dimensions are a bit smaller due to the mortise & tenon joints. Raised Garden Bed Kit Proudly Made in Homer Glen, Illinois USA. Constructed of Select Western Red Cedar. Aromatic and Naturally Insect & Rot Resistant. Handcrafted Mortise & Tenon Joinery. The Strongest Corner Joints Available. Easy to Assemble in Seconds, No Tools Required. Perfect for a Childrens Garden. Splinter Free! 100% Natural and Chemical Free. Safe for Vegetables and Best for Organic Gardening. If you have any questions about this product by Timberlane Gardens, contact us by completing and submitting the form below. If you are looking for a specif part number, please include it with your message. 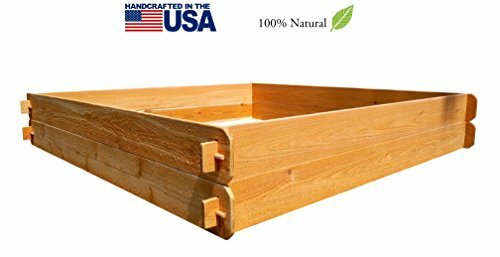 Gronomics Multi-Level Rustic Raised Garden Bed, 48 by 50 by 19"